It’s hard to deny that we live in the most prosperous time in human history. Great strides have been made in economics, technology, and medicine that are allowing people to live longer than ever before. This trend doesn’t show signs of stopping, either. Medical advancements married with new technology will push the boundaries of aging. Some out there even theorize that the first person to live to age 1000 has already been born. This, simply put, can be a nightmare for financial planners. Today, and more importantly in the next few decades, we will likely surpass traditional aging benchmarks having people live well into their 90s or 100s. This, coupled with decreasing purchasing power and inflation, makes financial planning for longevity a serious issue. 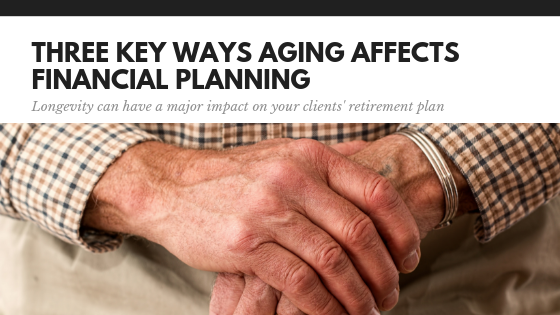 The secret to planning for extended longevity is relatively simple: over prepare. No one will regret dying with enough money in the bank, likewise, no one will wish that they would have spent more of their money earlier in their retirement. If you over-prepare, there’s little downside and you will have the peace of mind that your clients have the best shot at living a fulfilling retirement. When making your lifespan estimates, tack on extra years just in case. If your clients have enough money to comfortably make it to 90, find a way to stretch it to 100. If clients think that they will depart somewhere in their 80s because of family history, encourage them to consider the advancements of medical technology and plan for living longer. More important than simply guessing at how long a client may live, however, is finding solutions and technologies that can provide you with a customized, accurate projection of your clients’ projected lifespan. Up and coming software solutions, such as HALO, provide a clear and accurate report for clients on their projected lifespan and the out-of-pocket care costs associated with their projected longevity. Many people require significant medical interventions to support their day to day lifestyles as they age. This leads to cost overruns or unplanned expenses that can drain the purses of retirees fairly quickly. Using solutions such as HALO and accounting for inflation can help you plan for any additional contingency funds above and beyond what they are already planning for. Longevity will be one of the hardest changes for financial advisors to deal with in the coming years. The nature of money, the economy and retirement will change dramatically in the coming decades. The best thing that you can do today is to over prepare, overanalyze, and work toward giving your clients a strategy that plans for long life and high medical costs.